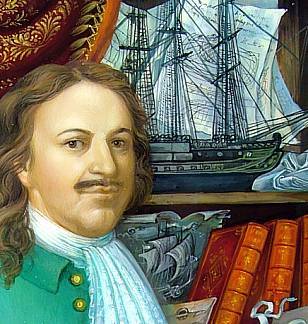 Portrait painting in the village of Palekh doesn't get any better than this handsome image of Peter the Great by Vera Smirnova. The box, in fact, was featured in two exhibitions over the last few years, including one in Palekh celebrating their 75th year anniversary and the other in Moscow commemorating the 60th anniversary of the WWII victory. 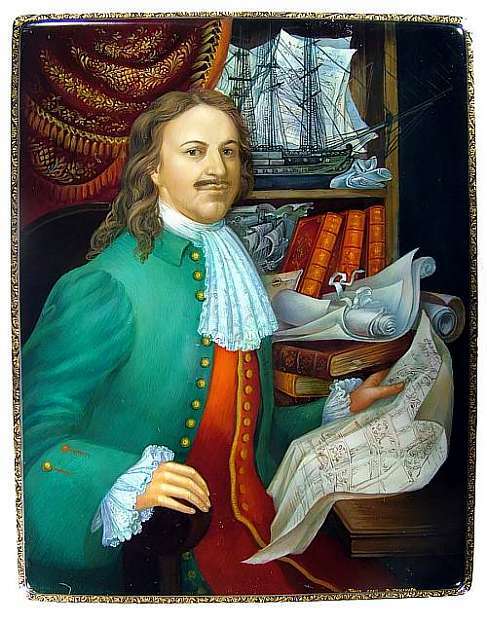 In this drawing, Smirnova used an old master painting as the model for Peter himself, but everything else around him was a product of her imagination, which she based on her knowledge of Russian history and this ruler's role in it. As with all Smirnova's pieces, the details are superb and Smirnova's extraordinary skill in drawing soft textures, like in the face of Peter, using egg tempera paints has never been more evident. A gold ornament frames the portrait and another decorates the sides. 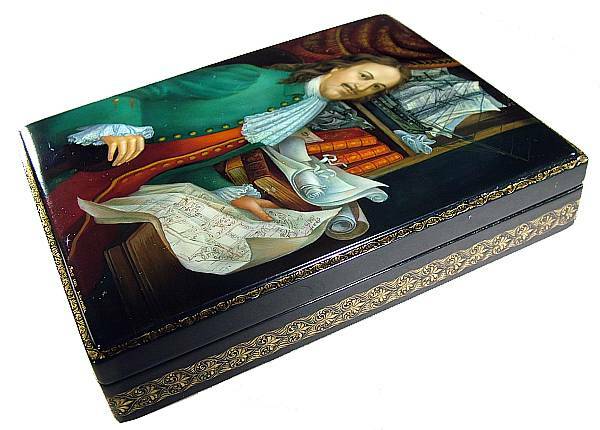 The box is made out of high quality papier mache and has a hinge at the left. Signed on the bottom with the name of the artist, village and year. One of the best portraits to come out of Palekh we have ever seen!